The three Pacific Northwest grain commodity commissions will team up to combat misinformation about the value of Snake River dams. SPOKANE -- The Pacific Northwest agencies representing grain farmers will unite to take a proactive approach against what they say is misinformation about the value of dams. The Idaho Wheat Commission, Oregon Wheat Commission and Washington Grain Commission made the decision Nov. 11 in Spokane during a tri-state commission meeting. Kristin Meira, executive director of the Pacific Northwest Waterways Association, outlined recent efforts by groups to revive arguments in favor of removing dams on the Snake River. The outdoor clothing design company Patagonia is the reason the argument recently resurfaced, Meira said. The company's founder and CEO is in favor of dam breaching and produced a documentary, "Dam Nation," that's "filled with inaccuracies," Meira said. Protest flotillas in Seattle, Portland and the Lower Granite Dam near Lewiston, Idaho were assisted by funding from Patagonia, Meira said. The groups' arguments include the claim that removal of the dams will help save orcas in the Puget Sound, Meira said. Orcas eat large Chinook salmon from the Columbia-Snake river system. "Then they make the leap to, 'If we just breach the four Snake River dams, they'll have a lot more Chinook to eat," Meira said. "The problem with that argument is, the reason the orca populations were decimated 40 to 50 years ago is because until the mid-1970s, people were out there rounding up the orcas in nets and hauling them away to Sea Worlds around the country." Orca populations have been slowly increasing since the 1970s. There are also more fish in the river system than before Bonneville Dam was constructed in the 1930s, Meira said, citing information from the Bonneville Power Administration and U.S. Army Corps of Engineers. The Snake River system averages a juvenile fish survival rate of 97 percent as they move through the dam. "We're approaching levels that they're not even achieving in undammed rivers," Meira said. "This is the latest, very extreme argument (opponents) have tried to put forth. To argue this is the time we should be talking about dam breaching is a really hollow cry." 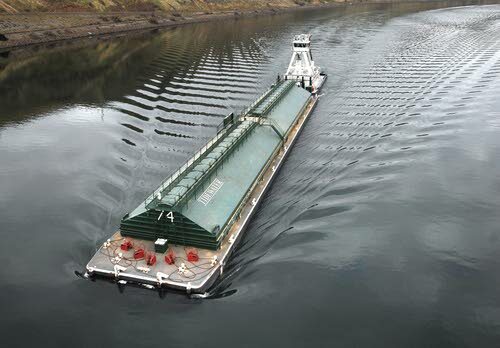 Roughly 10 percent of U.S. wheat exports go through the Snake River dams, Meira said. Farmers need to speak out about the importance of the system to their operations, she said. The waterways association maintains a website to combat misinformation. The dam-breaching groups are speaking to universities and reaching out to professors to back up their message, Meira said. "They have found they have not been successful in the courts or in Congress," Meira said. "All you have left is the press and going to colleges and doing flotillas and things like that." Blaine Jacobson, executive director of the Idaho Wheat Commission, said the industry needs to take a proactive approach against the protestors' messages. "We've got a great story, and it's not getting out there," Jacobson said. "The concern we have is that we're playing defense. They're setting the agenda instead of the people who really matter setting the agenda." The three commissions will discuss further action at their respective meetings. This has been a very tough year, but we cannot predict the long-term effects of climate change based on one year alone. We must consistently look for ways to better protect salmon as science helps us understand how our climate is changing and how the ecology of the system responds to those changes.